SEATTLE, Washington -- The phrase "no guts, no glory" doesn't just apply to athletes who are striving to excel. Salmon and other fish predators take the adage literally, by having up to three times the "gut" capacity they need on a daily basis just so they can "glory" when prey is abundant, University of Washington researchers have discovered. It's a previously unrecognized survival tactic that might apply to other top predators, such as wolves, lions and bears, according to Jonathan Armstrong, a UW doctoral student in aquatic and fishery sciences and lead author of a letter published recently in the journal Nature. "The predatory fish we examined have the guts to consume two- to three-times the amount of food that they regularly encounter. This much excess capacity suggests predator-prey encounters are far patchier � or random � than assumed in biology and that binge-feeding enables predators to survive despite regular periods of famine," Armstrong said. Co-author on the paper is Daniel Schindler, UW professor of aquatic and fishery sciences. "Guts are really expensive organs in terms of metabolism," Armstrong said. For instance, maintaining a gut can require 30 to 40 percent of the blood pumped by an animal's heart. Some animals have some capacity to grow or shrink their guts in response to changing conditions. For example, the digestive organs of birds that are about to migrate expand so they can eat more and fatten up. This is followed by a period when their guts atrophy and then, freed of the baggage of heavy guts, the birds take off. That and results from lab studies led some scientists to assume that predators eliminate excess digestive capacity to save energy in times of famine. But the UW findings show that many fish species maintain a huge gut, which enables them to capitalize on unpredictable pulses of food. "For predator fish, the world is a slot machine � sometimes they stumble upon small meals and other times they hit the jackpot. It's just not as predictable as some have thought," Armstrong said. 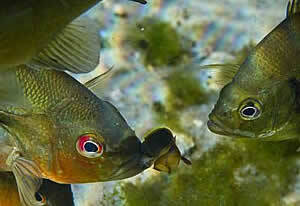 "Unlike some other animals, fish can't just hoard their food behind a rock in the stream and eat it later. They need to binge during the good times so that they can grow and build energy reserves to survive the bad times." Armstrong and Schindler hope that their results can help with ecological models used in conservation and management. "Ecosystem models typically assume relatively constant interactions between predator and prey but our results suggest such interactions are extremely patchy. We're excited to see if including this ecological realism might improve the predictions of these models."